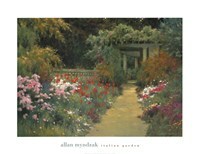 Contemporary Impressionist Allan Myndzak's timeless paintings evoke the serenity and stillness of an enchanted garden retreat. 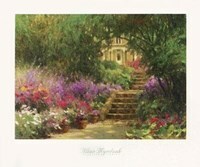 Like the French Impressionists, Myndzak continually explores the ever-changing character of light, inviting us into lush settings filled with beautiful flowers and blue skies. 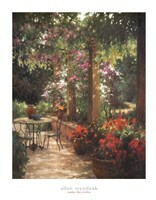 Working in his preferred medium of oil on board, the artist achieves a rich atmospheric quality in his landscapes. 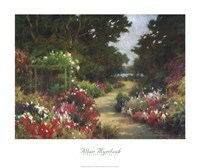 Myndzak's refined technique and palette of soft summer hues complement his selection of traditional impressionistic themes. Born in Vernon, British Columbia, Myndzak began painting at the age of eight, under the guidance of noted artist Jessie Topham Brown. His exceptional talent was rewarded with a scholarship to the Alberta College of Art in Calgary where he studied from 1972 to 1976. The artist's distinctive work has achieved worldwide recognition and is included in numerous corporate and private collections.